Gallia Antiqua ex Aevi Romani Monumentis eruta et Serenissimi Carnutum Ducis Munificentia Publicijuris Facta. A large and dramatic J. B. B. 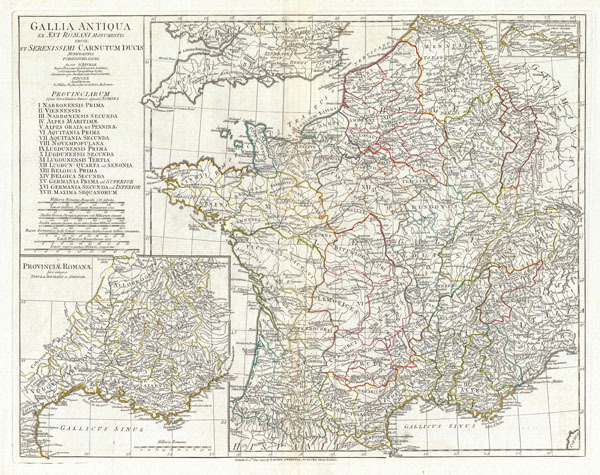 D'Anville map of Gallia or France in ancient Roman times. Covers from the southern part of England (Britannia) to the Pyrenees and the Mediterranean. Details mountains, rivers, cities, roadways, and lakes with political divisions highlighted in outline color. Features both ancient and contemporary place names, ie. Parisii and Paris, for each destination - an invaluable resource or scholars of antiquity. An inset in the lower left quadrant details Gallia's southern most Roman Provinces. A smaller inset labeled Batavorum Insulae appears in the upper right quadrant. Title area in upper left quadrant. Includes seven distance scales, top left, referencing various measurement systems common in antiquity. Text in Latin and English. Drawn by J. B. B. D'Anville in 1762 and published in 1794 by Laurie and Whittle, London. Rumsey 2603.041. Phillps (Atlases) 571, 572, 599.